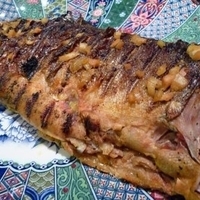 This is an excellent and flavorful way to cook fish that I adapted from the Barbecue Bible. I had a large, whole salmon (not a smaller snapper or pompano as recommended), and was hoping the flavor would be strong enough to impact the Salmon. Boy was I pleasantly surprised! The fish came out delicious and my guests all asked me to put it online as soon as possible. So here it is! Rince and dry fish. Make 4-5 diagonal slices to the bone in each side of fish. Put in a baking dish large enough to hold (you may have to wrap tail around a bit to fit). Combine lime juice, water, and salt in bowl and whisk till salt dissolves. Pour mixture over the fish in dish, turning once or twice to coat. Cover and marinate for 30 minutes. Put butter, lime juice, soy, garlic, shallot, ginger and turmeric in a bowl, cover loosely, and microwave for about 2 minutes till melted. Alternatively, melt on stove in a heavy sauce pan. Remove from heat and let cool. When grill is hot, drain the fish and reserve the liquid (called bumboo). Bursh each side of the fish and inside with the spiced butter, working the butter into the cuts. Then spoon some of the reserved bumboo over it. Spray the grill and the outside of the fish with an olive oil spray (or other oil spray) and place on the grill. Remove head (if still on). Insert a knife in the back bone of the fish and slice from head to tail. Holding the tail in one hand, use the knife to carefull peel the lower fillet from the bone. Gravity should help if fall off the bone. Then turn the fish over and scrape the knife along the bone to dislodge the other fillet. You should be left with just the bone in your hand which you can discard. This was really delicious...both the night we served it and the next day. The flavor really infused the whole fish! I am not a big fish eater, but since my son started dating his significant other who does not eat meat, I've been stretching my limited knowledge on cooking seafood. This looks fantastic and I'm going to give it a shot before the snow flies here in northern Idaho.